LOS ANGELES, California (Reuters) -- Dr. Henry Heimlich, inventor of the famous anti-choking maneuver, is working with doctors in several African countries to begin human tests of a controversial AIDS therapy in which patients are deliberately infected with malaria. The method has drawn the ire of the medical establishment, but Dr. Heimlich, the 83-year-old head of the Cincinnati-based Heimlich Institute, believes that using a curable form of the mosquito-borne disease to induce high fevers can stimulate the immune system to fight off HIV. His research on the topic has lead to partnerships with African doctors who are launching trials of the technique. "This comes up periodically, but malaria has never worked for anything. ... If Heimlich is really doing this, he should be put in jail," said Mark Harrington, executive director of Treatment Action Group, an AIDS research advocacy organization. He and other AIDS experts question the ethics of subjecting already ill people to another deadly disease, possibly without the informed consent disclosures required in this country. In 1993, the U.S. Centers for Disease Control and Prevention issued a memorandum saying malarial therapy could not be justified because it may well do more harm than good. The technique was used between 1918 and 1975 to combat syphilis that had spread to the brain, but that disease is now stopped at a much earlier stage by antibiotics. Heimlich, citing 1990s studies showing improved survival for African children who were HIV positive and had malaria, said in a recent interview that inducing high malarial fevers stimulates the immune system, but he is not sure why. He argues that infecting someone with one disease to cure another is not that unusual. "Cowpox is used to prevent smallpox," Heimlich said, referring to the smallpox vaccine. A Heimlich pilot study of the malarial therapy was carried out in China between 1993 and 1996 on eight HIV-positive patients, but they were only followed for two years. "After treatment, levels of ... T-cells increased rapidly," Heimlich said. HIV cripples the immune system by destroying those cells. But critics are quick to take issue with Heimlich. "Malaria kills 3 million people every year, and there seems to be evidence that malaria worsens HIV ... these are huge, huge ethical issues," Harrington said. The Chinese trial participants were not treated with anti-retroviral drugs and investigators did not have access to equipment for measuring the amount of HIV in blood, Heimlich said. Some 10 years later, there is even more need for effective AIDS treatment alternatives, Heimlich says. "We need to treat the immune system. With anti-retrovirals we have reached the roof," he said. These drugs interrupt the life cycle of HIV by blocking enzymes used by the virus to replicate after it enters healthy human immune cells. The drug cocktails can keep AIDS at bay for years, but the virus mutates and eventually evades treatment. 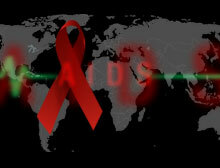 A significant percentage of chronic HIV patients in developed countries have become resistant to existing medications. In October, Heimlich presented his research at the Pan Africa AIDS conference in Nashville, Tennessee. "Subsequently, we have had visits from doctors from four African countries and have been making arrangements with a fifth country," he said. Heimlich said visiting doctors returned to their home countries with the intention of launching malaria/AIDS trials that will carefully monitor patients. "We should hear of some positive results within a year," Heimlich said. Meanwhile the University of California at Los Angeles is investigating whether two of its medical researchers took part in the Chinese malarial therapy trial. The university said a medical review board is looking into whether Dr. John Fahey and Dr. Najib Aziz violated policies that regulate tests on humans. On Feb. 16, the Cincinnati Enquirer published an article in which Dr. Heimlich described his work in China and said Dr. Fahey was involved. "He is a fine person who gave of himself and helped tremendously. It is exceedingly reprehensible for him to be challenged in this way," Heimlich said. In a statement, UCLA said it has never approved any research pertaining to malarial therapy studies for HIV. Heimlich said his nonprofit institute, at an annual budget of $100,000 to $150,000, will soldier on with the controversial AIDS research, but he hopes to uncover additional funding. "If all of your peers understand what you've done, you haven't been creative," he said.